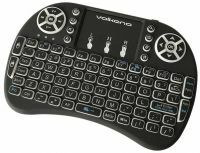 Volkano Control series Smart TV remote Control keyboard and trackpad Copyright © 2019 ComXpert International CC - COPYING IS ONLY ALLOWED FOR THE PURPOSE OF SENDING US ENQUIRIES. E&OE. Take full control of your Smart TV, Android TV box, personal computer, IPTV or HTPC with the Control Series remote. Featuring a full QWERTY keyboard and multi-touch trackpad, navigating your way through menus is a piece of cake. Home theatre? No more fumbling around in the dark to turn the volume up or down, the RGB backlight means finding the right button is a breeze. Ergonomically designed and with soft-touch rubber, and quick access buttons for common features it’s never been easier to get the most out of your smart device. The best price and guaranteed service and backup from official computer suppliers in South Africa for the VK20038BK Volkano Control series Smart TV remote Control keyboard and trackpad. The Volkano VK20038BK Volkano Control series Smart TV remote Control keyboard and trackpad is available for R264. The product is sold by ComX Computers as new. Prices are valid today 2019-04-22 (before 2019-04-23 , by quote, while stocks last). The product is expected to be in stock, although this is not guaranteed. Find related VK20038BK Volkano Control series Smart TV remote Control keyboard and trackpad products in our Keyboards (mini) / Airmouse Category for even more options. Read reviews and find out about VK20038BK Volkano Control series Smart TV remote Control keyboard and trackpad. Discounts, specials and cheap prices only at ComX Computers.